Deemed an invasive, non-game species in Texas, feral pigs may be taken by any means at any time, including helicopters. The Texas Parks & Wildlife Department has labeled them “nuisance animals” and advises against introducing them to one’s property for any reason. The USDA calls them “ecosystem engineers,” as they significantly transform habitats with their trampling and rooting, and they fiercely compete with livestock and wildlife for food and water. What are these undesirable creatures that spread chaos, destruction, and even disease throughout East Texas and other parts of the state? You guessed it: feral hogs. The damage wrought by feral pigs in East Texas is legendary, with property and habitat destruction surpassing $500 million annually and woe visited upon scores of animal and plant species, according to the U.S. Department of Agriculture. Unfortunately, these crafty beasts have few predators and are blessed with keen senses of smell and hearing, both of which have aided their population boom in recent decades. The U.S. feral hog population is currently estimated to be at about 5 million, with more than 2 million living in Texas, according to the Texas A&M AgriLife Extension. Deemed an invasive, non-game species in Texas, feral pigs may be taken by any means at any time. There’s no bag limit or season, and all you need to hunt them is a valid hunting license and permission from the landowner. And when the State of Texas says anything goes, they mean it. 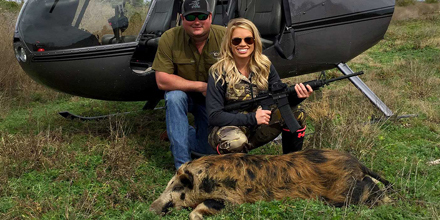 Night-vision goggles, thermal optics, drone photography/video, and even helicopters are allowed for seeking out and destroying the wily feral hog. As with other types of hunting, women are becoming more active in successfully helping to reduce the feral pig population, including bagging some huge specimens. But the unofficial Texas state record belongs to a man. Last fall, Joe Clowers harvested a monster hog in Gregg County in East Texas. After noticing the feral pig was tearing up the food plots on his property, he shot and killed the porker approximately 20 yards away from his home. It weighed 416 pounds.